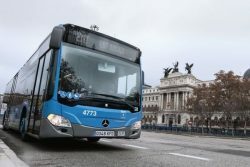 EMT, the transport company of the Spanish capital Madrid, is set to receive a total of 276 Mercedes-Benz Citaro NGT urban buses with natural gas drive in the next two years. This will be the fourth major order from Madrid in quick succession. 672 environmentally friendly Citaro NGT buses will soon be in service in Madrid. “We are particularly pleased with the order from Madrid. It clearly shows that our Citaro NGT is proving its worth,” explains Till Oberwörder, Head of Daimler Buses. EMT placed its first order two years ago for 82 urban buses of the newly launched Citaro NGT model. The following year, the company ordered another 314 buses. The current order means that there will be a total of 672 environmentally friendly Citaro NGT buses operating in Madrid from 2020. The vehicles now on order are two-door solo buses which are 12 metres in length. They are powered by the Mercedes-Benz OM 936 G natural gas engine which undercuts the Euro VI emissions limit by a significant margin in some situations. Its output and maximum torque of 1200 Nm enable the engine to achieve the same powerful performance as a diesel engine. In natural gas operation, the Citaro NGT (Natural Gas Technology) produces CO2 emissions are up to ten per cent below those of a diesel engine. And when using biogas, an NGT bus is almost completely CO2-neutral. What’s more, noise emissions are also up to 4 dB(A) lower. This corresponds to roughly half the subjectively perceived noise level. As a result, the Citaro NGT is ideally suited for use in busy cities and metropolitan areas where noise pollution is a problem. As Spain’s biggest urban bus operator, EMT’s fleet comprises 2000 buses. They operate on 209 routes with over 10,000 bus stops, covering around 90 million kilometres and moving 430 million passengers a year. With this new order, EMT is approaching its target of moving its complete fleet to low-emission and emission-free urban buses by the year 2020.